I loved Susan Fletcher’s Corrag, a novel about the Glencoe Massacre of 1692, but for some reason have never read any of her other books until now. That has clearly been a mistake because House of Glass is another impressive novel. Although it is a very different type of story from Corrag, there are still some similarities, such as the beautiful writing and the interesting, unusual protagonist. The novel is set in 1914, just before the outbreak of the First World War. Our narrator is Clara Waterfield, a young woman who suffers from osteogenesis imperfecta, better known as brittle bone disease. Because of her condition, Clara has led a very sheltered life, kept indoors where she is less likely to fall and injure herself. She has made the best of her situation, using books to educate herself on the people and places she is never likely to see, but still she longs to go out into the world and have the experiences that other people take for granted. When she is twenty years old, Clara loses her mother to cancer and, left alone in their London home with her well-meaning but over-protective stepfather, she takes her first tentative steps towards taking control of her own life. Venturing as far as Kew Gardens, Clara discovers a love of plants and returns day after day to learn everything the head gardener can teach her about botany. Her new skills lead to her being summoned to Shadowbrook, a large estate in Gloucestershire, where the owner, Mr Fox, is looking for an expert to help fill his new glasshouse with plants from Kew. Almost as soon as Clara arrives at Shadowbrook, however, she becomes aware that something is wrong. Why do the housekeeper and the maids seem so afraid? Could the house really be haunted by the ghost of a former occupant, Veronique Pettigrew? And is the mysterious Mr Fox ever going to make an appearance? House of Glass seems at first to be a typical Gothic ghost story. It certainly has all the elements of one: a neglected mansion with secrets hidden behind closed doors; unexplained noises in the night; servants who hint at trouble in the house’s past; and various other eerie occurrences which may or may not have a rational explanation. There are definite shades of classic novels such as Jane Eyre and Rebecca or, to give a more recent comparison, The Little Stranger by Sarah Waters. Throughout the first half of the book the sense of mystery builds as we try to work out what is really happening at Shadowbrook and Clara is as much in the dark as we are. Because of the way her life has been until now, her contact with other people has been very limited which means, as well as trying to solve the mysteries of Shadowbrook, she also has a lot to learn about social relationships and human nature. As she moves around the house and its grounds, asking questions and making observations, she not only makes some discoveries about Mr Fox and the Pettigrews, but she grows in confidence as a person too. I didn’t always like Clara quite as much as I felt I should have done, but I admired her for her strength and resilience. In the second half of the book, everything changes; some revelations are made which send the story in a different and slightly unexpected direction and although some of my questions – and Clara’s – were answered, I wasn’t entirely convinced by these new plot developments. I wasn’t disappointed, exactly, but I did feel that I was reading a different type of story than it had seemed to be at first. Now I need to go back and read some of the other Susan Fletcher books I seem to have missed out on over the last few years. Apart from this one and Corrag, have you read any you can recommend? Thanks to Virago for providing a copy of this book for review via NetGalley. 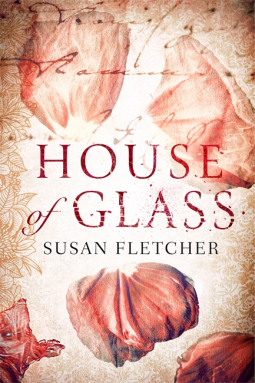 I was interested in your post as I’ve just embarked on ‘The House of Glass’ – I’m about 20 pages in. I’ve read several books by Susan Fletcher, and I love her writing style. My favourite is ‘The Silver Dark Sea’, which isn’t particularly historical but which is full of references to stories, folk tales and song, and is probably up there in my all time top 50. That’s high praise for The Silver Dark Sea! I’ll have to try that one next, I think. I hope you’re enjoying House of Glass. I am a huge Sarah Fletcher fan and so was delighted to see from your post that this book is out. Like Pam, I loved The Silver Dark Sea. I also adored Let Me Tell You About a Man I Knew. Stunning writing which is memorable and beautiful. I remember seeing some reviews of Let Me Tell You About a Man I Knew a year or two ago and wanting to read it, but never got round to it for some reason. I’ll have to find time for both that one and The Silver Dark Sea as they both sound good. Gothic ghost story… hm… maybe (or more correctly, probably) not, but thanks for the review. Well, this book was more than just a typical gothic ghost story – but if you don’t like that sort of thing, it’s probably not for you. I noticed this in the library the other day and wondered about bringing it home, but I was already laden down as it was. I’m grateful that you’ve reviewed it here, because I don’t think it is for me and that is as useful as thinking I should have brought it after all. It sounds as though you made the right choice, then. I enjoyed it and I do think Susan Fletcher’s writing is beautiful, but I can see why it wouldn’t appeal to everyone. Hmm, Fletcher has been uneven to me. Corrag was wonderful, but Let Me Tell You About a Man I Knew, although interesting, wasn’t as good. I see she has written a llot more books than I thought, though. A few people have recommended The Silver Dark Sea, so I’ll probably read that one next. I love the sound of this, thanks! Great! I hope you have a chance to read it. I think you’ve actually hit the nail on the head with “I felt like I was reading a very different type of story” – as far as I’m concerned, what Fletcher does is make us think we’re reading a Gothic ghost tale, before showing us that we’re really not. That’s what made the book so impressive, for me. Yes, that’s what I found impressive about it – although I do love Gothic ghost stories so would have been happy for it to continue in that direction too! I was captivated by the beginning of your review and then disturbed to learn that the story changed so much. Did you like it?